People who frequent gyms often complain that running on treadmills and riding stationary bikes may be good exercise, but they feel pointless since you don’t get anywhere. 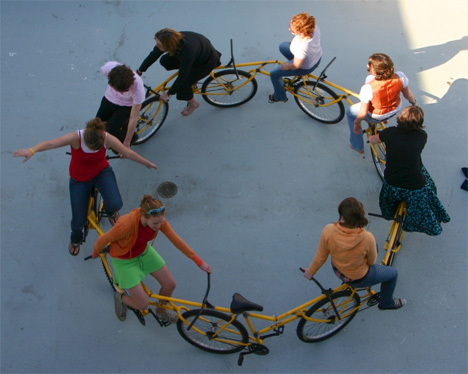 The Circular Bike by artist Robert Wechsler can get you out of the gym and into the fresh air…but you still won’t get anywhere riding it. The sculpture is made from nine salvaged bikes arranged in a circular formation with each frame welded to the one in front of it (kind of like a less-horrifying version of the Human Centipede). 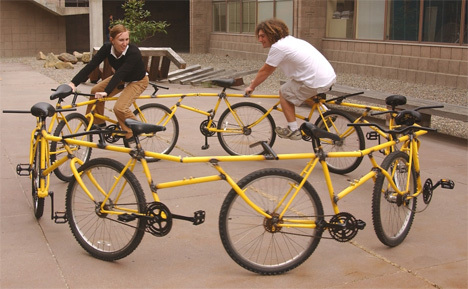 Riders can hop on and pedal wildly, but they will be forever stuck in the loop defined by the bikes’ bodies. 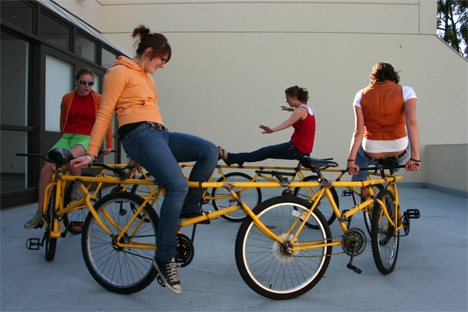 It’s sort of like a merry-go-round made of bicycles…now if only you can get one or two people to pedal while you recline and enjoy the ride. According to Wechsler, the bike is often left in public places where it can attract riders. You’d have to be pretty bold to climb up onto what looks like a sculpture in a public place, but if you did your courage would be rewarded with what looks like a super-fun ride. See more in Bikes & Cycles or under Transportation. August, 2011.